Nicolás Maduro (left) and Venezuela&apos;s opposition leader and self-proclaimed interim president Juan Guaidó. When you’re the biggest, richest, luckiest guy on the block, it’s right to help your neighbors, but there’s only so much you can meddle without messing things up. Call it the Goldilocks conundrum. Too little attention by Washington to the woes of Latin America over the last century and we were shirking our responsibility as a democratic, humanitarian, prosperous beacon for the hemisphere, relegating our less-fortunate neighbors to suffer at home or seek refuge in the United States. Too much meddling or open intervention, on the other hand, came back to burn us, turning neighbors against us for generations. We rarely get it just right. 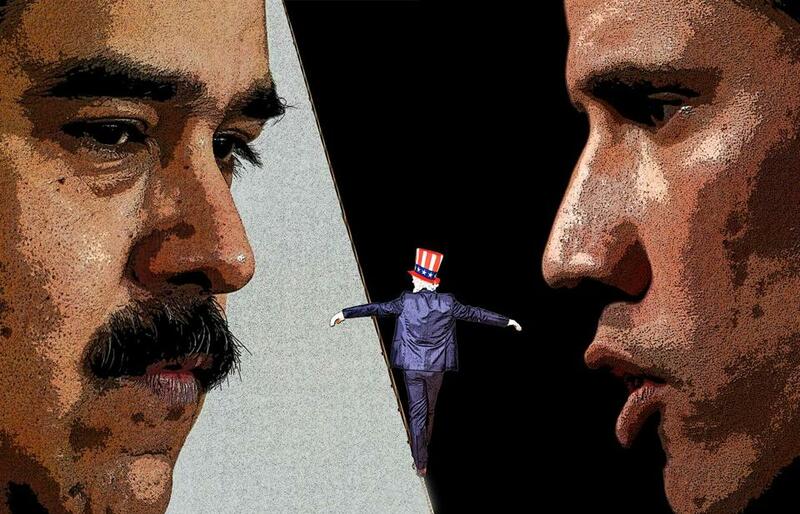 Venezuela presents that challenge now. It has more oil than Saudi Arabia — but a higher poverty rate than Liberia. Where petrol was famously cheaper than bottled water, staggering mismanagement has crippled domestic refineries, creating fuel shortages, lines at gas stations, and the dire threat of trucks unable to transport food. The disaster has been brewing for years, while the United States mostly looked away. Nicolás Maduro’s predecessor, Hugo Chávez, was elected in 1998 because of frustration among the poor and working class over neoliberal economics that failed to share the country’s wealth. Styling himself as Robin Hood, Chávez nationalized companies, used high oil prices to build popular social programs, let other industries wither, forged a tight alliance with Cuba, and reveled in anti-US rhetoric — especially after a failed 2002 coup attempt that the CIA knew about in advance. After the failed ouster, Chávez consolidated increasingly authoritarian rule, backed by a military whose loyalty he fostered through cronyism. Maduro inherited the pseudo-socialist petro-economy on Chávez’s death, in 2013, but Chávez’s charisma and luck didn’t transfer. Some 98 percent of Venezuela’s currency comes from oil exports, so when prices tanked after Chávez’s demise, mismanagement and scant cash sparked food and medicine shortages, inflation of as much as 1.37 million percent, and protests suppressed with lethal force. Maduro refused humanitarian aid, and a mass population exodus — 13 percent since 2015 — strains neighboring countries. More than a dozen European Union countries endorsed Venezuelan opposition leader Juan Guaido as the country’s interim president on Monday, piling the pressure on embattled President Nicolas Maduro to resign and clear the way for a new presidential election. The opposition won the National Assembly in 2015, but Maduro used a stacked judiciary to create a puppet congress. With Maduro’s popularity in tatters and his rivals disqualified, more than half the country boycotted his reelection last year, widely dismissed as a farce. Maduro’s refusal to step down in January coincided with the emergence of his first credible challenger. Juan Guaidó was sworn in as head of the popularly elected National Assembly, and at a mass rally Jan. 23, Guaidó declared himself interim president under the constitution, which empowers the legislative leader when a president loses his mandate. The United States and most Latin American states swiftly recognized Guaidó, and this week most of Europe did too. The Trump administration imposed sanctions to deprive Maduro of US oil income and redirect it to the opposition. 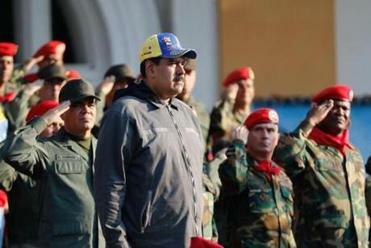 Cuba, Russia, China, Turkey, and Hezbollah sided with Maduro, who shows no signs of giving up. “The people and the international community are with Guaidó. He’s a very good politician and a breath of fresh air. What’s left is the praetorian guard of the military — that’s the thing to watch,” Moisés Naím, a former Venezuelan cabinet minister, World Bank executive director, and vocal critic of Chávez and Maduro, told me. Unlike past opposition leaders, Guaidó, 35, can’t be dismissed as a silver-spoon elite. With modest roots and more than a passing resemblance to Barack Obama, he’s won supporters in former Chávez strongholds. “Venezuelans have to take the lead,” Michael Shifter, president of the Inter-American Dialogue in Washington, told me. When Trump says all options are on the table, when interventionist national security adviser John Bolton poses with a notepad reading “5,000 troops to Colombia,” when Elliott Abrams, convicted in the Iran-Contra scandal and linked to the coup attempt on Chávez, is appointed special envoy for Venezuela, we send a terrible signal. Instead of pressuring the military to back Guaidó, it’s likely to have the opposite effect. For proof of our heavy-handed backfires, look no further than Cuba’s enduring regime, despite the Bay of Pigs invasion, a 60-year embargo, and countless attempts to assassinate Fidel Castro. Consider Manuel Noriega of Panama, whom the US helped seize power, before we ousted and imprisoned him. Remember the illegal Iran-Contra scheme that failed to oust Nicaragua’s communists. And don’t forget US-backed coups in Argentina, Brazil, Chile, Guatemala, and beyond that yielded decades of dictatorship and antidemocratic abuses. So what should the United States do? Keep sanctions on the regime while helping the opposition supply aid to starving people. Lend assurances to the Venezuelan military, who may support Guaidó if they know they won’t end up in US prisons. Encourage an international coalition to support a democratic transition and fair elections. And remember, nothing rallies people behind an embattled despot faster than the perceived threat of an armed interloper. Let’s not give him that lifeline. Indira A. R. Lakshmanan’s column appears regularly in the Globe. She is the executive editor at the Pulitzer Center on Crisis Reporting.